Check out all of the resources from Different from the Other Kids here! Thank you to all who bought the book. We plan to add more resources as we collect them, so don’t forget to check back. Follow Different from the Other Kids on Facebook and Twitter and get notified of all things Different from the Other Kids. 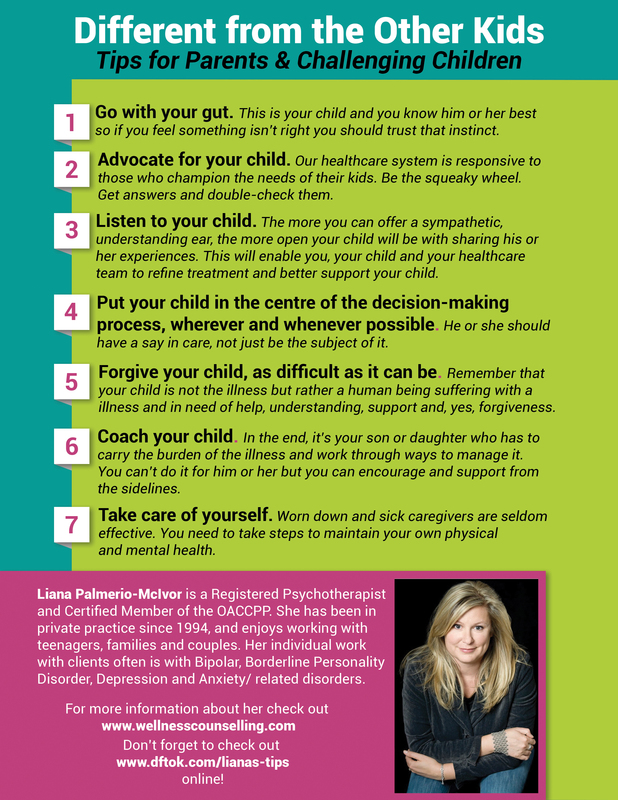 We’ve got a collection of tips for parents of challenging children from a registered psychotherapist, Liana Palmerio-McIvor, who spoke with Angela in chapters 12 & 13 of Different from the Other Kids: A Book of Interviews for Parents of Challenging Children. All of the tips handily provided on a printout as well! Click to get the full version below. You can find more from Liana Palmerio-McIvor at her website, The Wellness Counselling Group. Angie has provided us with an article of her own entitled, “The Mental Health Diet” which includes an easy to follow guide for parents and challenging children. There is some useful information regarding how nutrition and fitness can play a major role in managing day to day. Click here to download the article and checklist today! Jennifer of My Mind Fitness has written a few articles and even recorded a video about her passion for essential oils. Click here for her tips on How to Choose the Right Oil for Your Family, a bit about Jen’s story here and her website for My Mind Fitness here. Here is a collection of different resources we mention in the Different from the Other Kids podcast… Check out the links below! Click here to listen to all episodes of the DFTOK podcast. In Episode 39 with Maria I., she referenced the National Use of Force Framework that Canadian police are trained on. Click here to listen to Maria’s episode. In our two interviews with Patrick James, Episodes 48 & 49, Patrick discusses the Ontario Human Rights Commission and an FAQ Fact Sheet. Click here to see the fact sheet: Human Rights Code of Ontario, from the Ontario Human Rights Commission. Listen to Patrick’s interviews by clicking Episode 48 – Part One and Episode 49 – Part Two. In Episode 59, Sargeant Dave Tutte from the Halton Regional Police Service, Sgt. Tutte references the “Four Pillars of Mental Health” used by the Halton Police.